A branch of geology that studies the geological formations of the remote past: "Archeogeology integrates some archaeological fields with relevant geological sciences to investigate the geological effects on historical sites, monuments, and other properties concerning constructive materials (type, situation, and position of mines and other natural resources) and destructive the geological forces in the environment; such as, earthquakes, faults, and earth movements." "Archeogeologies make use of geological maps that indicate prehistoric layers of the earth's crust, faults, historic and recently found mines, hydrology layers, and seismological information all of which provide basic information in this field." 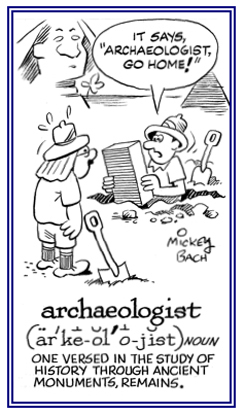 A professional scholar who studies and reconstructs the human past through its physical remains: The work of an archaeologist involves the scientific finding, collecting, cleaning, sorting, identifying, and measuring objects found in or on the earth or sea. Usually the motives of archeologists are to record and to interpret ancient cultures rather than to collect and to display artifacts for a profit. 1. The theory of origins. 2. The science of government. 1. A concept in which the ideal city is a massive vertical structure, which preserves more of the natural environment, a concept combining architecture and ecology as envisioned by Paolo Soleri. 2. Etymology: arc(hitecture) plus (ec)ology. The study of the planet Mars. 1. A reference to diseases of the joints. 2. The study of functional and structural changes made by diseases of the joints. The scientific study of connecting bone structures: When he finished his medical training, Lyle was convinced that he wanted to specialize in arthrology so he could develop a better understanding of the joints, ligaments, etc. of his patients. The study of the various diseases that occur between the bones of the body: There was an entire department at the medical school for arthropathology, allowing the students to study the diseases of the connecting links in the fingers, toes, knees, elbows, etc. under scientific conditions. A specialist in the measuring of starquakes. 2. The study of the interior of stars by means of oscillations on their surfaces. The oscillations studied by asterioseismologists are driven by thermal energy converted into kinetic energy of pulsation. This process is similar to what goes on with any heat engine, in which heat is absorbed in the high temperature phase of oscillation and emitted when the temperature is low. The star on which this technique has been applied most effectively is the Sun, where the technique is known as helioseismology. The stars that asteroseismologists study are constantly vibrating, sending compression waves richocheting through their interiors to the surface, where they manifest as changes in the stars’ brightness. 1. The field of astrogeology (a planetary science discipline concerned with the geology of the celestial bodies; such as, the planets and their moons, asteroids, comets, and meteorites) which focuses on the study of rocks and the conditions by which they form. 2. The science of meteoritic stones. A form of divination based on the theory that the movements of the celestial bodies; such as, the stars, the planets, the sun, and the moon influence human affairs and determine the course of events. The study of the influences of the stars on human destinies: "Each day he would check the astrology section in his newspaper to to see what it said about his sign." Showing page 8 out of 80 pages of 1193 main-word entries or main-word-entry groups.